It’s no secret that I love taking care of my skin. I have been wanting to take my skincare regimen to the next level for some time now (couple of years actually!). 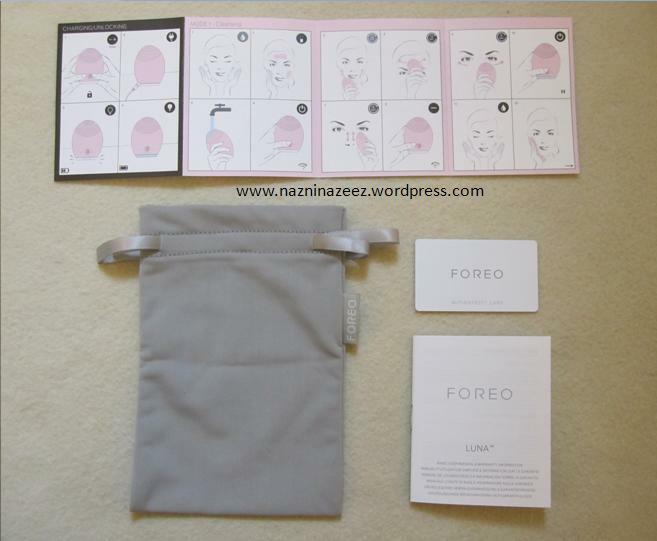 End of 2013, I got to know about the a revolutionary skincare product – Foreo Luna!. I was instantly interested. The more I knew about it, the more I wanted it in my life. So in March 2014, I placed an order for it!. I have been using it since then. So this review is based on 5 months of it’s usage. Before we get ahead with the review let me tell you that my skin type is normal, leaning towards dry in winters. I opted for the Pink Foreo Luna which is for Sensitive / Normal skin type. The other two options were White for Ultra – sensitive skin and Blue for Combination skin. What is Foreo Luna? – It is a cleansing device which takes your regular cleansing routine to the next level, giving you deep daily cleansing experience, leaving your skin looking radiant and youthful. On opening the box, this is what you see. I love the packaging! What all does a Foreo Luna come along with? Luna has two sides to it. One is the cleansing side, which has nonabrasive, rounded silicone touch points on it, which glides across your face to ensure the whole process is soft and gentle. T-Sonic™ (transdermal sonic) pulsations are applied across the dermal surface to instantly refresh the look and feel of the skin. These pulsations are channeled through the silicone touch-points, removing dead skin cells, and cleansing pores of dirt, oil and makeup residue, while improving the absorption of your skincare products. The reverse side is the anti-aging side. It has ridges there and the frequency of T-Sonic™ pulsations produced by this side is lower than the cleansing side. This side is to be applied to five areas on your skin, where lines form as you age. The lower frequency will release the muscle tension in these areas, increase the production of collagen, diminish lines and wrinkles and make your skin more elastic. 1) First, I wet my face and then apply my cleanser. I noticed that using a foaming cleanser delivers the ultimate result for me. My favorite is Olay Total Effetcs Foaming Cleanser. Another cleanser that has worked well with my Luna is Neutrogena’s Deep Clean cleanser. 2) I click the power button to switch on the Luna. It starts pulsating. I start at my chin and go in upwards motion onto my cheeks and along my jawline. After 15 seconds, there is a pause in the pulsation and that’s when you know that it’s time to move onto the next side. It’s easy to miss this ‘pause’ if you are really not looking out for it. The first time I used it, I was literally just gliding it all over my face since I didn’t really know when the pauses came!. What’s interesting is that there is an LED light at the bottom of the device. With each pause, it flashes once. So concentrate on that the first time and you will know when the pauses come. 3) I use it on my forehead for 15 seconds. It pauses then. 4) I use it on and around my nose for 15 seconds. The tip of the ergonomically created Luna is perfect to clean the sides of the nose. 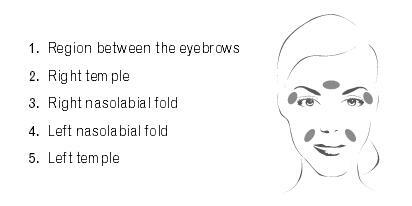 5) For the last 15 seconds, I gently glide it across the upper cheek bone, under both the eyes. 6) When the last 15 seconds is up, you will feel the pulsations pause 3 times in quick succession. That means the one minute of cleansing is over. However, unless you press the middle button it doesn’t stop. I actually use the Luna on my neck for about 30 seconds and then press the power button. The light at the base turns on. This is now in stand by mode. 7) I wash my face and the Luna. The Luna is completely water proof!. 8) I carry on with my skin care routine, applying products and all. Once I have applied my serum, I press the middle button of the Foreo again and this time, it’s the anti aging side that starts to pulsate. I relax my face completely and press the ridged side to the 5 key areas mentioned before. Each area gets 12 seconds. So that makes it one minute of anti-aging treatment!. It’s a very relaxing experience and you can really feel the tensions getting released. After the one minute is up, again you will feel the pulsations pause 3 times in quick succession. 9) I then press the power button once more and the device switches off. After the cleansing mode or the anti aging mode, if you keep your device on stand by mode for more than 3 minutes, it automatically switches off. When charging, the LED light at the bottom of the device keeps pulsating. Once it stops, you will know it’s fully charged. A fully charged Luna can be used upto 450 times before you need to charge it again!. Since the initial charging, I haven’t charged it again in these past 5 months! Once you get your Foreo Luna, I highly suggest you download it’s user manual from their site. It’s very useful. Click here to download it. 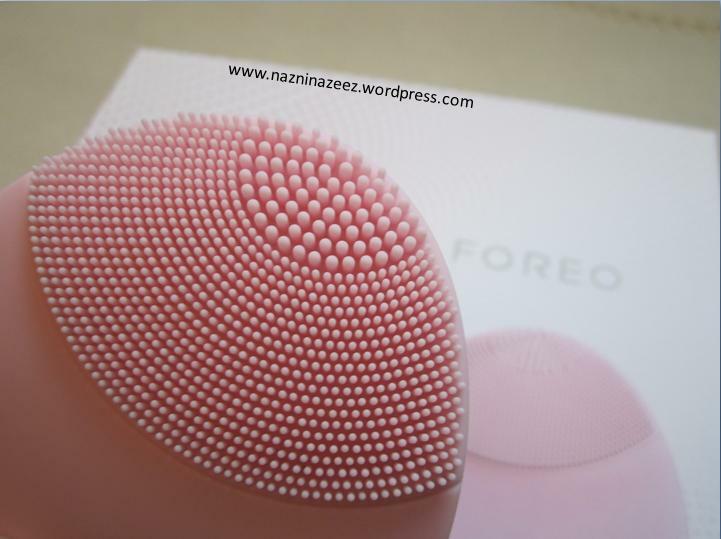 Foreo offers a quality guarantee of 10 years!. It really does lay the foundation for a life time of beautiful skin! 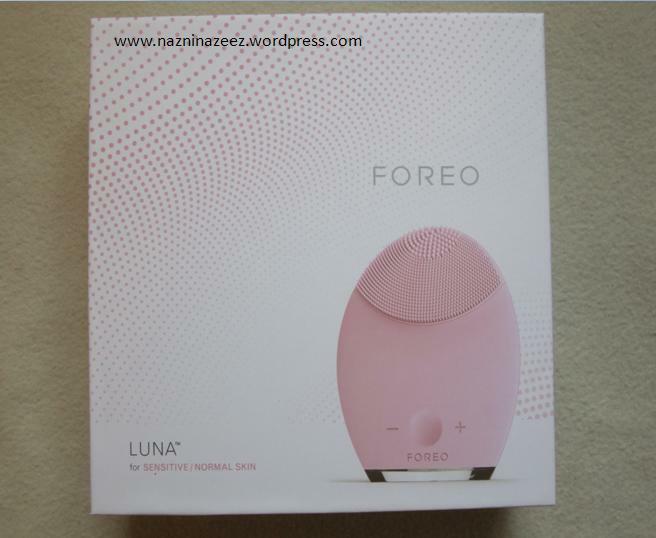 Foreo Luna has 8 speeds. You can set it at any speed and each time you switch it on, the device will remember your choice. I set it around 5. Foreo Luna helps in removing makeup completely from your skin. However, you cannot skip the usage of makeup removers. You do need to use a makeup remover to clean your makeup and then use the Luna to get the final remnants of makeup off your face. Foreo Luna is a personal skincare device. You shouldn’t share it with anyone else. Foreo is so travel friendly and fits into your palm. While traveling, you can lock the device. To lock, simply press the + and – buttons on either side of the power button together and hold it for 3 seconds. To unlock, repeat the same action. I have got to say, I have good skin. Touchwood!. I am not boasting!. I have a solid skincare routine that I have been following religiously for some years now. I wanted to see how this device could take my skin to a better place. It felt like I was challenging the power of this device!. It says on it’s site www.foreo.com that you will find a difference in just 3 days. For me it actually took a week to notice a difference. That difference was extremely soft skin!. Also, my skin has a more brighter look. It felt really good and I still enjoy that feeling. I cannot recommend this product enough!!. You really need to check it out. If you have problem skin then I am sure you will feel the difference much earlier than the one week period it took for me. Shipment: The shipping fee is $9.90 (AED36.36). It was shipped right to my doorstep by UPS courier. I placed the order on 15th March and on 22nd March it was in my hands!. Foreo is designed and developed by Foreo Sweden but manufactured in China. So it was shipped from there. I obviously do not own a Clarisonic. So this comparison is based on what I have researched on and found out. As I told at the beginning this post, I had been wanting a beauty device for couple of years now. I had been eyeing the Clarisonic Mia 2 and the more videos I watched by YT beauty gurus the more I wanted that. At that time, I didn’t know it was available in the local Sephora store. I thought it’s only available online on Souq.com. It was ridiculously priced there. Good models were definitely above AED800. The price held me back. Also the Clarisonic US website didn’t ship internationally. That’s when Foreo made a grand entrance. I compared these both and these facts really made me favor Foreo over Clarisonic! Foreo doesn’t have any brush heads that need to be replaced. Clarisonic’s brush heads need to be replaced every 3 months which means the initial investment you make for that device is just the beginning!. You will need to keep paying more to use it. However, Foreo is a one time investment. Foreo is really hygienic. The silicone device doesn’t offer an environment for bacteria to proliferate. 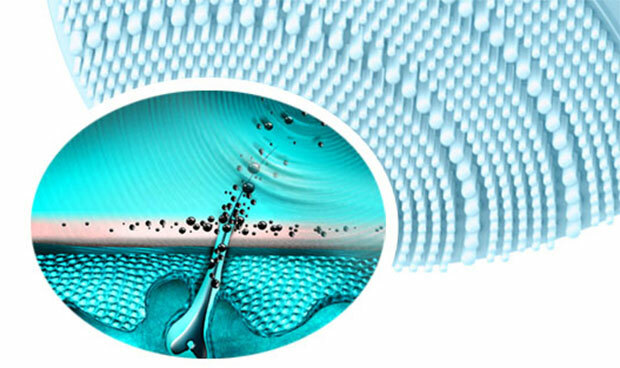 However, the Clarisonic’s brush head gets dirty over time and can harbor bacteria. 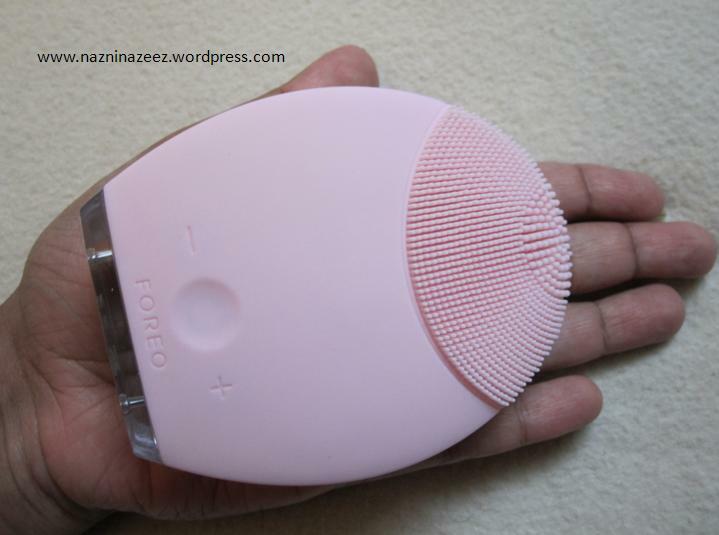 I felt Clarisonic’s brush might be more abrasive when compared to Foreo’s soft and gentle silicone touch points. So once I decided it’s Foreo I was opting for, I had another comparison to make! Luna has an anti aging side, Mini doesn’t. I am all about anti-aging!. This was the first and main point that I was completely sold on Luna. Luna is bigger than Mini. Mini, as it’s name suggests, is small. I initially felt the shape of the Foreo to be very strange. If it was small, I felt it might slip off my hand (though it doesn’t). Anyways, I felt Luna would be better to hold on to. So I ordered it and now I feel the size of Luna is perfect and if it was smaller than that, I might not have liked it much.